Run the installer and follow the prompts in the Install wizard. On completion, verify that the Node.js folder is in your system environment path. Open a command prompt, and enter npm to verify the Node.js package manager is available. After that, the terminal window displays the help file for npm. If you do not see this, and see an error message instead, it indicates the node installation did not complete successfully. You may need to reboot the system to see the changes, or you may need to reinstall Node.js. Download and install the latest Java Development Toolkit (JDK) from http://www.oracle.com/technetwork/java/javase/downloads/index.html . It is required for generating certificates during installation, which allow a secure connection to be setup between your browser and the local tooling environment. Follow the installer to install the package. For Window search “Path” and open “Environment Variables” dialog. After that find in “System variables” JAVA_HOME variable and make sure it has the right path. If it doesn’t exist create a new one. Download “resources” folder with SAPUI5 core files from nexus https://nexus.wdf.sap.corp:8443/nexus/service/local/repositories/deploy.releases/content/com/sap/ui5/sapui5/1.28.20/sapui5-1.28.20-static.zip and extract zip archive. NOTE: this link accessible only in SAP-corporate network. OpenUI5 library is open source. Open <your project folder>/www/webapp/ and set direct service paths (without proxy). Open a command prompt, and enter npm to verify the Node.js package manager is available. After you issue this command, the terminal window displays the help file for npm. If you do not see this, and see an error message instead, it indicates the node installation did not complete successfully. You may need to reboot the system to see the changes, or you may need to reinstall Node.js. Go to “www” folder in your cordova project and remove all from there. 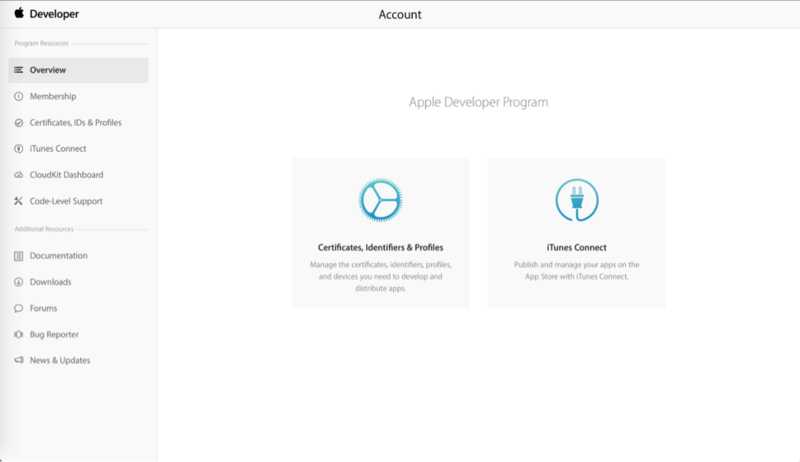 After the required program is purchased please login to https://developer.apple.com, select Account tab and then Certificate, Identifiers & Profiles. For development purpose development certificate is required. In the left panel select Certificates and create development certificate. Create AppID in order to register application in dev portal. More details here: https://developer.apple.com/library/mac/documentation/IDEs/Conceptual/AppDistributionGuide/MaintainingProfiles/MaintainingProfiles.html Please notice that AppID bundleID field should match the bundle ID in the Xcode. For Ad-Hoc distribution please register devices in Device section. Please use the link above and review “Registering Devices Using Your Developer Account“ section. Create provisioning profile. Provisioning profile links appID, list of devices together and used by Xcode to build the app. Download certificate and Provisioning profiles on the build machine. First step is to make sure you have “iOS Device” selected for the target – don’t have your device plugged in! Then select Product > Archive from the menu. The Organizer window will open showing your app. Click the “Export…” button and you will be prompted for an export method. Choose “Save for Ad Hoc Deployment” or “Save for enterprise Deployment”. You’ll be prompted to select your Apple Developer Portal team and confirm the Export. If you have created and installed a Provisioning Profile it should find your Profile and Certificate. The IPA file is ready for upload. Install the app on device via itunes.